The book is a collection of peer-reviewed scientific papers submitted by active researchers in the 37th National System Conference (NSC 2013). NSC is an annual event of the Systems Society of India (SSI), primarily oriented to strengthen the systems movement and its applications for the welfare of humanity. A galaxy of academicians, professionals, scientists, statesman and researchers from different parts of the country and abroad are invited to attend the conference. 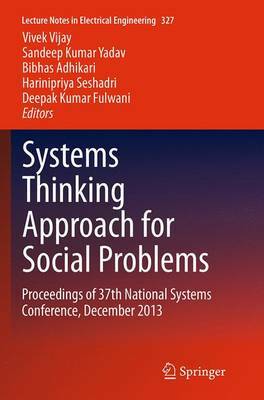 The book presents research articles in the areas of system's modelling, complex network modelling, cyber security, sustainable systems design, health care systems, socio-economic systems, and clean and green technologies. The book can be used as a tool for further research.